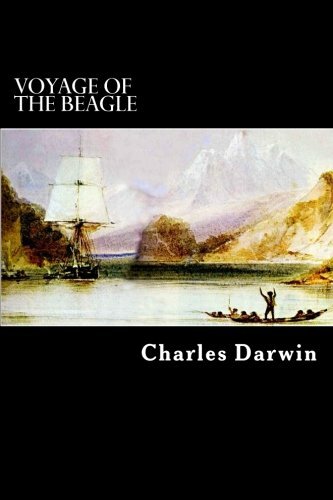 Amazon.com description: Product Description: The Voyage of the Beagle is a title commonly given to the book written by Charles Darwin and published in 1839 as his Journal and Remarks. The title refers to the second survey expedition of the ship HMS Beagle, which set sail from Plymouth Sound on 27 December 1831 under the command of Captain Robert FitzRoy, R.N.. While the expedition was originally planned to last two years, it lasted almost fiveâthe Beagle did not return until 2 October 1836. Darwin spent most of this time exploring on land (three years and three months on land; 18 months at sea). The book, also known as Darwin's Journal of Researches, is a vivid and exciting travel memoir as well as a detailed scientific field journal covering biology, geology, and anthropology which demonstrated Darwin's keen powers of observation, written at a time when Western Europeans were exploring and charting the whole world. Charles Robert Darwin, FRS (12 February 1809 â 19 April 1882) was an English naturalist. He established that all species of life have descended over time from common ancestors, and proposed the scientific theory that this branching pattern of evolution resulted from a process he called natural selection.